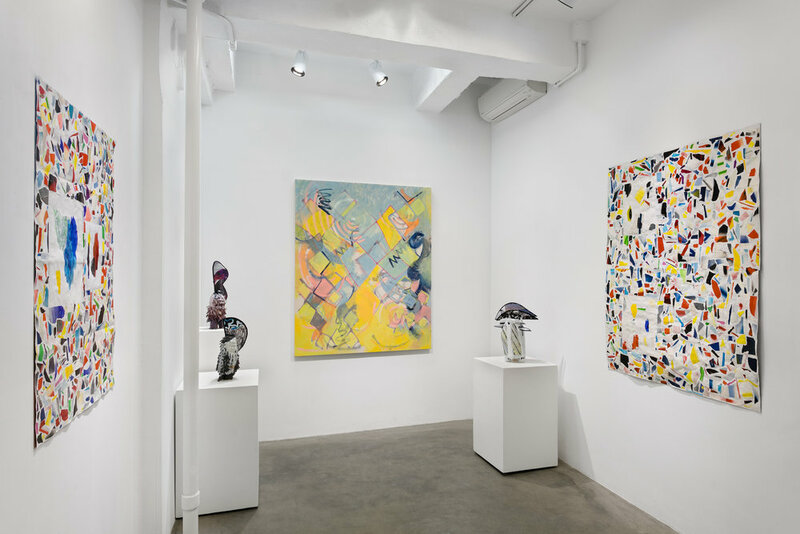 The gallery is pleased to announce a three-person exhibition featuring paintings, works on paper, and sculptures by Brooklyn-based artists Lauren Portada, Josh Slater, and Leah Tacha. Aspects of printing lend a sense of quickness, lightness, and atmosphere to handmade works. Lauren Portada's acrylic on canvas paintings feature subtle colors that hover inside and around a malleable diamond-shaped pattern. Here, printing is incorporated as an initial element of her process whereby the canvas is used as a screen. Spraying paint through the back of the weave, elongated curves appear on the front surface of the painting, providing a compositional starting point for her works. In Electric Eels and Fences, deep blue and pink zig-zags dart and pulsate across the surface, communicating a sense of quick movement enhanced by broken outlines and a sometimes porous treatment of paint. Josh Slater's works on paper include multiple bits of colorful papers, arranged into an all-over pattern. 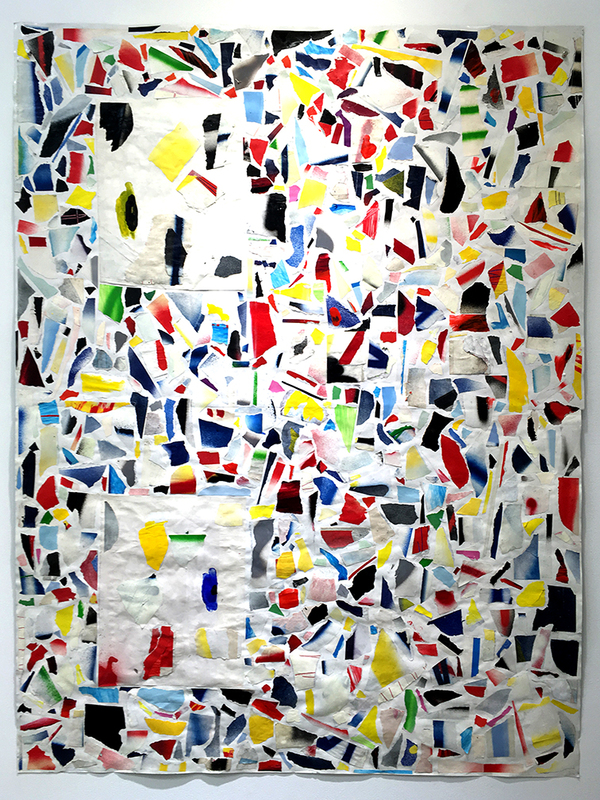 Each small piece of paper is torn from a separate collage that Slater makes with spray paint and found printed papers. Pages torn from books and magazine, as well as movie posters, sometimes sprayed with additional colors, serve as individual units of color in these works. Torn and irregular edges and sheets of hand-painted white pages create openings within the dense abstraction. Leah Tacha's sculptures combine wheel-thrown, glazed ceramics with shaped boards covered with digital prints. The prints juxtapose striped patterns with landscape imagery and extend from openings on different sides of the ceramic. Printed imagery relates to sculpted aspects of the clay, such as repeated diagonal lines in "Flyer," and fur in "Swayer," casting solid clay and stiff paper with an airy feel of plants or hair moving in a breeze. 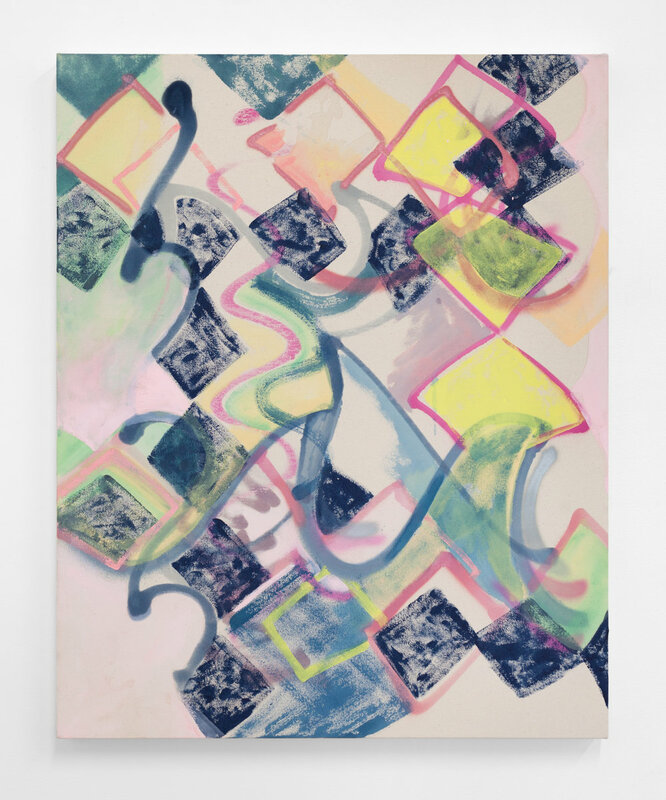 Lauren Portada's exhibitions include "Boggy Soggy Squitchy Pictures," solo exhibition, 2014, Kent Gallery, NJ, "Nasty Women," group exhibition, 2017, Knockdown Center, Queens, NY, and "Quorum," group exhibition, 2017, The Pit, Los Angeles, CA. She received an MFA from the University of Illinois at Chicago in 2005 and a BFA from Fordham University Lincoln Center in 2000. She is one of the founding directors of the artist-run gallery, Regina Rex. 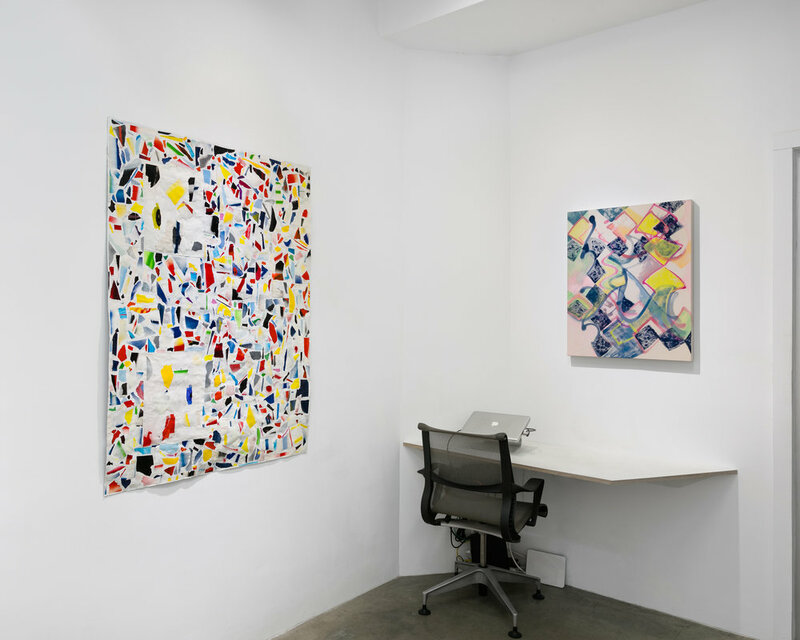 Josh Slater's exhibitions include "Diverge/Convene: Contemporary Mixed Media Art," group exhibition, 2017, San Diego Art Institute, San Diego, CA, and "Josh Slater: Electric Mantra," solo exhibition, 2015, Kristen Lorello, NY. He received a BFA from the School of the Museum of Fine Art/Tufts University in 2001. 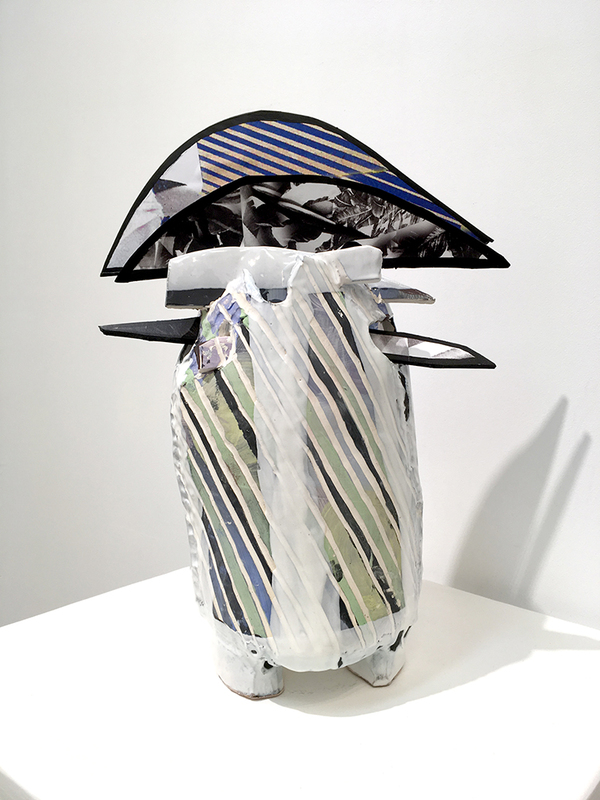 Leah Tacha's exhibitions include "Fix Up, Look Sharp," solo exhibition, 2016, 106 Green, Brooklyn, NY, and "Trophy," solo exhibition, 2014 Sardine, New York, NY. She received an MFA from SUNY Purchase College in 2009 and a BFA from the Cleveland Institute of Art in 2007.